Do you watch the PGA Tour, college football, or NASCAR? Then according to a new survey, you're most likely a Republican. But if you'd rather settle in for a Lakers-Celtics game -- or some WWE pro wrestling action -- then there's a good chance that you vote Democrat. That's according to a study from National Media Inc., a Republican firm, which worked with the Nielsen and Arbitron rating agencies and studied more than 200,000 adults. As Hotline reports, the survey found that sports viewers in general lean Republican -- but the breakdown still holds some surprises. For example, WWE fans are solidly blue -- perhaps in part because they tend to be younger. 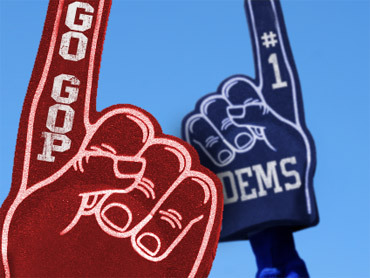 The problem for Democrats is that wrestling fans don't vote: The survey found that they are the group of sports fans with the lowest voter turnout, meaning that their political beliefs don't translate into political support. Skewing slightly red (but not too far from the middle) are fans of Major League Baseball, the National Football League, the Olympics, college basketball, supercross/motocross and high school sports. On the blue side of the divide: Fans of men's and women's tennis, Major League Soccer, the NBA and WNBA, monster trucks and extreme/action sports. As Hotline points out, the survey has practical implications for political parties. If you want to win a Republican primary, for example, it makes sense to advertise during professional golf. An added benefit comes from the fact that sports fans tend to view events live -- meaning they won't fast forward through the commercials on their digital video recorders.